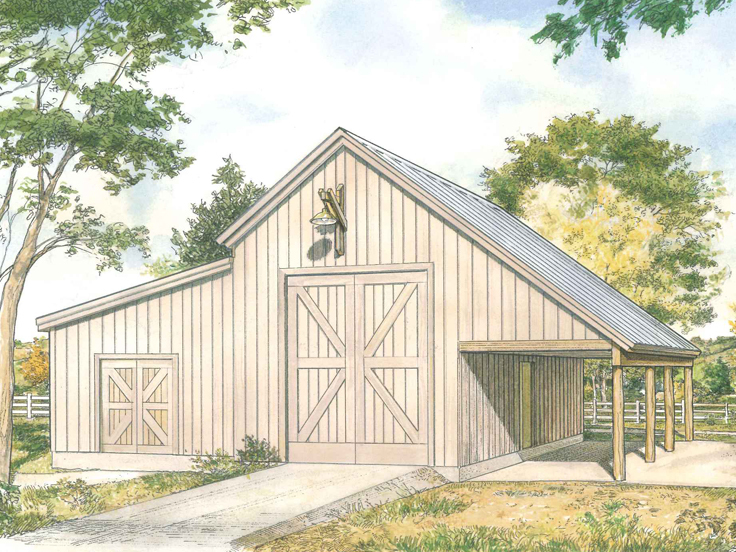 Check out this multi-purpose outbuilding plan. With its drive-thru garage bay, it is ideal for RV or boat storage and eliminates the hassle of backing your RV or boat and trailer out of the garage. The drive-thru features is convenient and safe while a vaulted 15’ ceiling and oversized garage door easily accommodate your needs. Two enclosed storage spaces provide plenty of room for storing camping and fishing gear as well as tools or lawn and garden supplies. Don’t miss the open shed area that delivers ample of room for storing large or bulky items that you need to protect from the elements. Add value to your property and that much needed storage space with this drive-thru, RV garage plan. To view our entire collection of garage plans, please visit, TheGaragePlanShop.com.